"The most important period of life is not the age of university studies but the period from birth to the age of six... for that is the time when intelligence itself, her greatest implement, is being formed..."
Dr. Maria Montessori (1870-1952) an Italian physician, educator, and anthropologist revolutionized the way on how we value and educate children today. 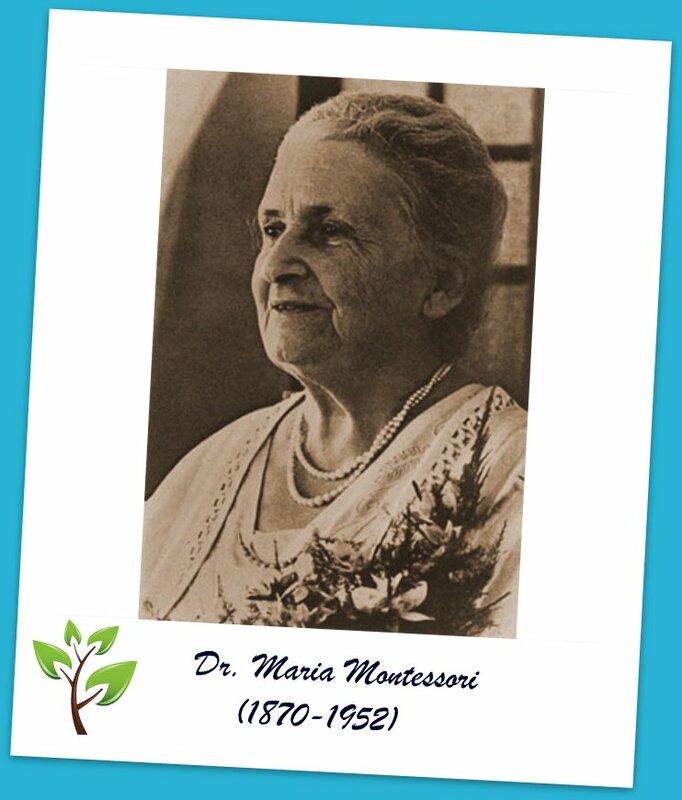 Dr. Montessori devoted her studies to the field of education and discovered universal principles underlying the development of children. Her method is clear, practical, and scientific, derived from the data of anthropology and natural sciences. 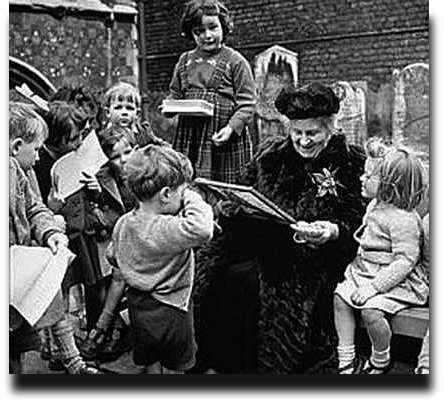 Dr. Montessori wanted to change the role of education, not to use education as a mere transportation of information or acquisition of knowledge, but to go beyond that - she wanted the purpose of education to become an "aid to life", to prepare children for life and not how to make a living. She disagreed on how children were taught by regurgitating information without any sense or purpose or how schools concentrate on quantitative scores in their evaluation of children. She questioned, "what is the use of transmitting knowledge if the individual's total development lags behind?" What she saw in children was different. She observed that a child's work is "to create the person he or she will become". Children want to become active contributors of their environment, and they were continuously seeking to perfect themselves. Children are in a constant state of metamorphosis, creating for themselves the individuals they are going to be. And the environment in which they evolve will shape them. This environment will allow children purposeful movement. Children become active participants in their environment. The Montessori classroom provides the freedom within the limits of an environment which develops a sense of order and self- discipline. Children experience and develop a sense of purpose to what they have learned. She also noted, "follow the spirit of the child". She felt that nurturing the spirit of the child and understanding their natural development is vital in the complete formation of a human being. Children imbibe values of respect for nature, caring for and acceptance of others, and becoming an active and responsible member of society. In the Montessori classroom, learning initially occurs through the use of materials which provide a concrete representation of an abstract concept. Step by step the child is led from the concrete to the abstract. Concepts are known for why they work before the theoretical is expected. The child becomes a self directed learner, not dependent upon the focus of the adult. The teacher is the guide for the child; showing the way or unlocking the door to the environment, thus enabling the child to reach his or her full potential. Today, the term "Montessori" refers to a form of education established by Dr. Maria Montessori. Through her scientific observations and work with children she developed meticulously designed apparatus and an environment prepared for meeting the progressive needs of the developing child. This approach is centered on the child and fosters a love of learning. The adult is the link to the environment, encouraging the growth of self initiated study. Dr. Montessori opened her first school in 1907. Casa dei Bambini was in the projects of San Lorenzo, Italy. It proved to the world what a child can achieve when given the opportunity. Her method is tried and true. It is comprehensive and corresponds with today's scientific research in psychology, child development, and neurology. "I have studied the child, I have taken what the child has given me and experienced it and that is what is called the Montessori Method." The Montessori classroom is indeed a child's world, geared to size, the pace and interests of boys and girls between the ages of three to six. It is designed to put the child at ease by giving him freedom in an environment prepared with attractive materials. These materials are arranged on low shelves within easy reach to even the smallest youngster. The tables and chairs in the classroom are movable, permitting flexible arrangement for many activities. The children also work on small mats on the floor where they are naturally comfortable. The Montessori materials in the classroom can be divided into three main groups: The Practical Life Exercises, which are the beginning activities for three and four year-old children; The Sensorial Materials, which can be used by all ages in the class; and The Academic Materials, which await each child's moments of interest in reading, arithmetic, and geography. In a Montessori classroom there is no front of the room and no teacher's desk as a focal point of attention because the stimulation for learning comes from the total environment. Dr. Montessori always referred to the teacher as a "directress," and her role differs considerably from that of a traditional teacher. She is, first of all, a very keen observer of the individual interests and needs of a child, and her daily work proceeds from her observations rather than from a prepared curriculum. She demonstrates the correct use of materials as they are individually chosen by the children. She carefully watches the progress of each child and keeps record of his work with the materials. She refrains, if possible, from interviewing and allows him to discover his own error through further manipulation of the self-correcting material. This procedure follows Dr. Montessori's principle that a child learns through experience. There is always a busy hum of activity in a Montessori classroom because the use of the materials involves many motions - walking, carrying, pouring, speaking, and particularly the constant using of the hands. All activity, however, is guided by respect for the teacher, a respect for work of others, and a respect for the materials themselves. Dr. Montessori never equated goodness with silence and immobility. Self-discipline, she felt, should be acquired gradually through the absorption in meaningful work. When a child becomes vitally interested in a particular classroom activity, his behavior almost always matures. If a child misbehaves in a Montessori classroom, the teacher usually helps him to select work which will more fully absorb his attention. WHY THE MIXED AGE GROUPS? If the classroom equipment is to be challenging enough to provoke a learning response, it must be properly matched to the standard, which an individual child has already developed in his past experience. This experience is so varied that the most satisfying choice can usually, be made only by the child themselves. The Montessori classroom offers him the opportunity to choose from a wide variety of graded materials. The child can grow as his interests lead him from one level of complexity to another. Having children ages three through six together permits the younger children a graded series of models for imitation, and the other ones an opportunity to reinforce their own knowledge by helping the younger ones. Because the children work individually with the materials, there is no competition in the Montessori classroom. Each child relates only to his own previous work, and his progress is not compared to the achievements of other youngsters. Dr. Montessori believed that competition in education should be introduced only after the child has gained confidence in the use of the basic skills. "Never let a child risk failure," she wrote, "until he has a reasonable chance of success." The use of individual materials permits a varied pace that accommodates many levels of ability in the classroom. A younger or slower child may work for many weeks on the same piece of equipment without retarding the other members of the class. Advanced children in the same room can move from one piece of equipment to another very quickly, thus avoiding the boredom of waiting for other members of the class to catch up. The children with a high level of ability are constantly challenged by the wide variety of materials and their many uses. It is a well-established fact that young children mature at very different rates and their periods of readiness for academic subjects vary a great deal. Because interest is stimulated and the materials are at hand whenever the child is ready, some youngsters in a Montessori class begin to read and calculate at an unusually young age. However, very early learning is not the norm, nor was it ever Dr. Montessori's objective. Her ideal was only that the learning experience should occur naturally and joyfully at the proper moment for each individual child. "It is true, we cannot make a genius, " Dr. Montessori once wrote, "we can only give each individual the chance to fulfill his potential possibilities to become an independent, secure, and balanced human being."